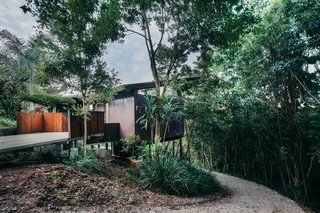 Nestled within a rainforest on a private 20-acre plot in New South Wales, this compact Cor-Ten steel and glass guest retreat is a hidden oasis. 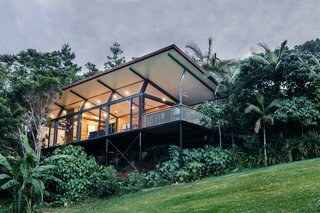 Hidden Studio is a 646-square-foot guesthouse that overlooks both the hinterland and Pacific Ocean. 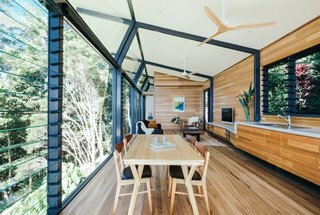 Designed by local practice Harley Graham Architects, the small dwelling responds to two existing buildings on the same property—a family house and a writer’s cabin. 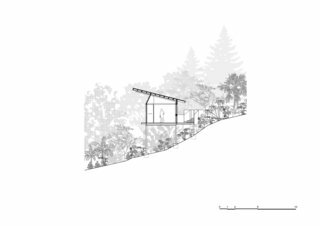 The small studio is sited along a gentle slope and is raised upon steel supports to take in views of the tree canopies. 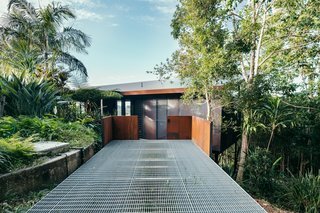 The home's low-maintenance Cor-Ten steel exterior can be easily washed down when needed. 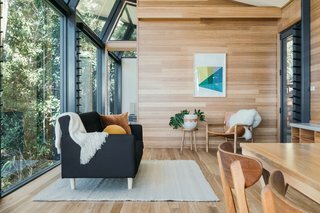 The new guest retreat—along with the main house and cabin, which were designed by late Sydney School architect Vale Ian McKay—are owned by retired journalist couple Colleen Ryan and Stephen Wyatt. A ramp leads to the entrance door. Because the studio does not have air-conditioning, it relies on natural ventilation for passive cooling. Its north orientation harnesses good solar gains. 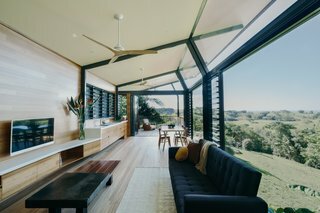 The couple were looking to create a new space for visiting family and friends that would dialogue the distinct Australian vernacular of the two existing McKay-designed dwellings on their property. They also wanted the studio to sensitively respond to its natural environment. 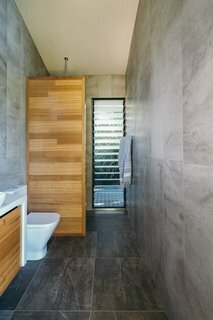 Except for the ceiling and bathroom floor, the entire interior is clad in blackbutt timber, which is also used for all the joinery. 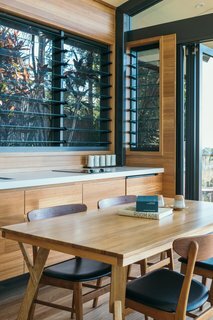 "The wood adds warmth and consistency to the space, balancing the tough exterior," explains architect Harley Graham. Simple yet stylish, the studio has a kitchenette and dining area. "We understood the need for professional architectural knowledge. 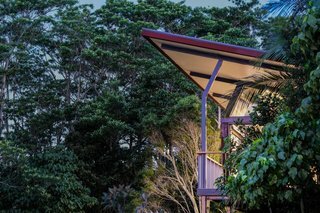 We wanted a one-bedroom glass and Cor-Ten box that sat up in a rainforest canopy. The Harley Graham team delivered just that with a lot more style," says Wyatt. 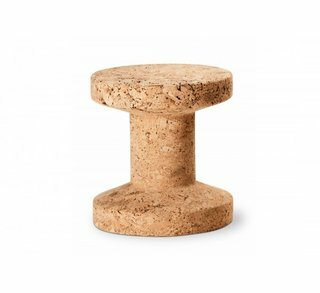 Jasper Morrison became a leading figure of New Simplicity, a movement that advocated a more modest and also more serious approach to design. 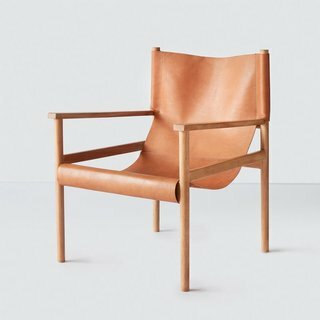 A modern take on the classic safari chair. Luxuriously thick leather, vegetable-tanned and sun-dried (no chemicals here!) to enrich its warm caramel hue. Paired with an all-natural wood base and slingback style, this chair has major lounge appeal. 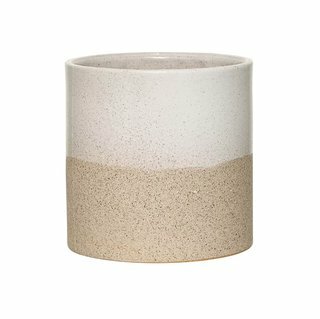 Pots from Australian brand Pop & Scott. The textiles and home goods are from Byron Bay brand Pampa. 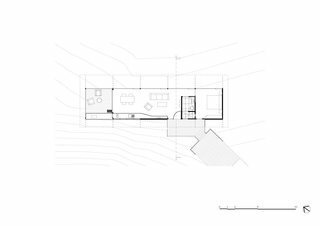 The entrance to the studio is accessed via a low ramp on the top of the slope. 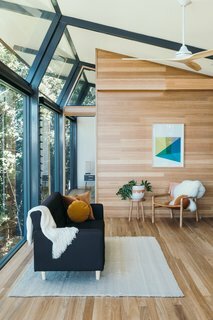 On the opposite side, facing a sea of trees, is a fully glazed wall that makes the compact, one-bedroom retreat feel incredibly open. The studio uses recycled water for all purposes. 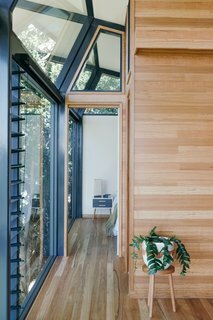 "By carefully considering the orientation of the studio, the large glass façade is protected from low morning sunlight, whilst capturing desirable northern winter sun as the day progresses. 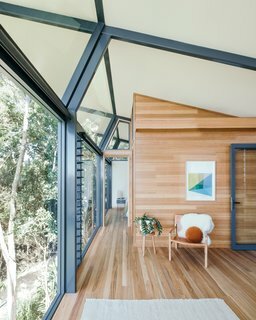 The angled ‘crank’ in the portals makes the roof appear to float over the pavilion, forming a large protective plate and further opening the space," notes Graham. Another peek inside Hidden Studio.